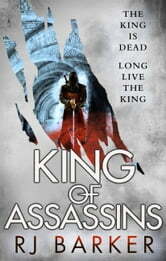 The epic conclusion to RJ Barker's debut fantasy trilogy, set in a world ravaged by magic, featuring a cast of assassins, knights, and ambitious noblemen. Assassin Girton Club-Foot has lived in relative peace for many years, but now his king, Rufra ap Vthyr, eyes the vacant High-King's throne and will take his court to the capital. In a viper's nest of intrigue, the endgame of twenty years of politics and murder will be played out in the bid to become the King of all Kings.